Fresh Enoki Mushroom,100 grams, clean and cut in small pieces. First make the dressing by adding all the dressing ingredients into a bowl and mix well. If you don’t like to eat too spicy you can reduce the chili. If you prefer a bit sour, you can add a little more of the lemon juice. Boil the water with 1 teaspoon of salt, when boiling add the Eryngii mushroom for 3 minutes and the Enoki mushroom for a bit shorter (this thin golden needle mushroom called by Thais are easily cooked). 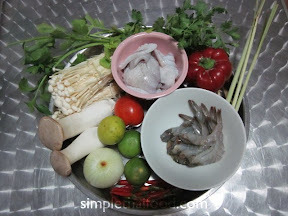 The seafood shouldn’t be cooked for too long also, otherwise they will become too hard, with boiling water I cooked the squid for 3 minutes and the shrimp even less than that. 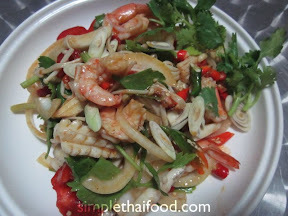 Drain the cooked seafood and mushroom and put aside. Put the cut Onion, Tomato, Sweet Pepper in a big bowl and then the cooked mushroom and the seafood, top with salad dressing and mix well. On Serving add the sliced lemon grass and coriander.